A Crook County woman was rescued Tuesday morning after becoming stranded on an island in the middle of the Crooked River near Post. 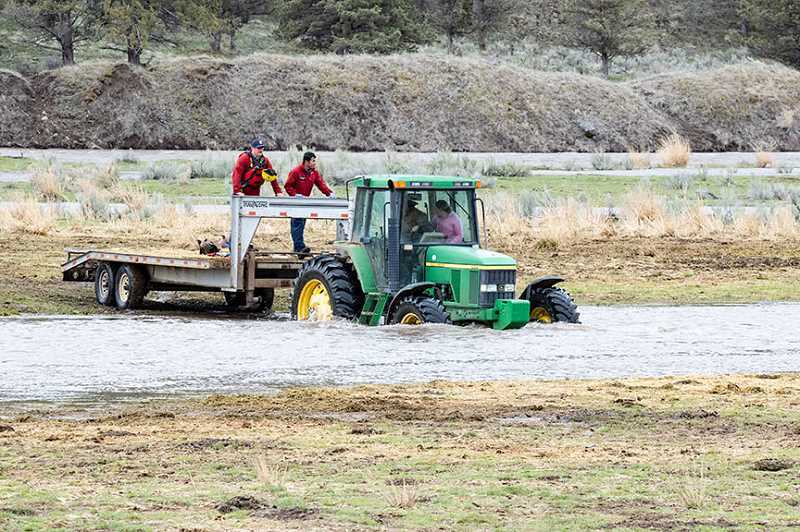 According to a Crook County Sheriff's Office media release, authorities received a call around 10:20 a.m. regarding a woman, later identified as 31-year-old Prineville resident Kristine Voakes, who had been thrown from her horse and was stranded on an island in the Crooked River. Due to the warming weather and rain, the Crooked River above the Prineville Reservoir is swollen, creating several islands in the river. Crook County Sheriff's Office Emergency Manager Mike Ryan was in the area checking the high water and was first to arrive on scene. Crook County Fire and Rescue also responded along with other CCSO deputies. Authorities learned that Voakes had been working on the ranch and went to check on some cows that were stuck on an island in the river. She and another unidentified man crossed a portion of the river on horseback, successfully making it to the first island. They then proceeded to a second island through a deeper, swifter channel. Both riders were bucked off their horses, and while the man made it safely back to shore with both horses, Voakes became stranded and was wet and cold. Crook County Search and Rescue was activated along with the Deschutes County Sheriff's Office Search and Rescue Swift Water Team. The island that Voakes was stranded on was large enough for a safe helicopter landing, so AirLink and Lifeflight were both contacted to assist, but due to weather, neither was able to make it to the location of the rescue. Members of the Crook County Fire and Rescue had some swift water gear on board of their ambulance as well as being trained on its use. Sheriff's deputies and fire personnel were able to be driven across the first crossing safely by the ranch tractor. A member of the Crook County Fire and Rescue then deployed into the water and crossed the second deeper, swifter crossing to Voakes' location. She was then placed into safety gear and a life vest and pulled back across the river by deputies and fire personnel. She was then driven back across the second crossing to a waiting ambulance. She was treated and released at the scene with no injuries other than being cold. There is a short video of the rescue on the Crook County Sheriff's Office Facebook page. "There was a good outcome today with no injuries, but CCSO would like to remind everyone that with the warming weather and rain the rivers are running high," the release said. "Please use caution around all the rising waterways."